Rosecroft01263 715779work01603 870304fax Self-cateringRosecroft, a flint cottage, is situated in Holt in North Norfolk known for its interesting shops, restaurants and Country Park. The coastal towns of Sheringham, Cley and Blakeney are close by offering the attractions of beaches, boat rides, nature reserves, theatre, restaurants, pubs and shops. 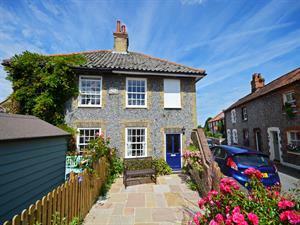 An attractive brick and flint semi detached cottage. Rosecroft offers weekly bookings starting on Saturday. Rosecroft, a flint cottage, is situated in Holt in North Norfolk known for its interesting shops, restaurants and Country Park. The coastal towns of Sheringham, Cley and Blakeney are close by offering the attractions of beaches, boat rides, nature reserves, theatre, restaurants, pubs and shops.